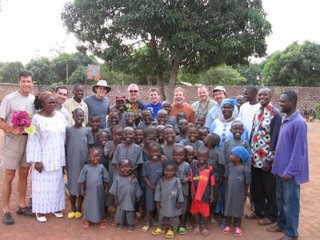 “In 2008, Hope Community Church raised funds to build 10 new wells. That provides clean drinking water to over 5,000 people who until last year had none. Not to mention the latrines that go with them and the agroforestry skills they are being taught such as planting fruit trees. It means new life to the people of the villages. “One place we drilled was in the village where last year we met the little boy who was so sick we didn’t think he was going to make it. Jim Hocking has seen him since and he is doing so much better! “Also last year we sponsored over 100 more orphans from the C.A.R. (through Vision Trust International) This means a home to live in, food, and a Christian education. Also, from the money we raised last year we are able to help maintain the wells we have already dug which is a huge task in itself. “We are excited to visit the villages we have helped and visit with those people that we are getting to know; our brothers and sisters in the middle of Africa. “For 2009, we have an additional task. Along with digging new wells, Powersecure (http://www.powersecure.com/ the company Mark Martyak is a big part of) has donated 3 generators. Now these are not the simple kind you buy for your homes; these are full-on generators that had to be custom-made and shipped over by boat in a huge container. “One will be used to power the radio station ICDI has. This station is heard by thousands all over the C.A.R. and they are able to spread God’s Word far and wide because of it. “Another will be used to power the ICDI main offices and guest house.